Kyle Kuzma brings the ball up the floor against the Philadelphia 76ers on Feb. 10, 2019. One player nearly scored 40 points. Another nearly recorded a triple-double. But individual efforts could only carry the Lakers so far, as team defense doomed them in Philadelphia. They shot a robust 51.6 percent from the field but had no answers on the other end, as the 76ers steamrolled their way to a 143-120 victory. The Lakers (28-28) have been an elite defensive team for most of the season, but it has suddenly become an area of weakness. Over the last 11 games they are surrendering a league-high 125.5 points per contest. With only one match left before the All-Star break, the Lakers sit 2 1/2 games behind the LA Clippers for eighth place in the Western Conference. They have 26 games to make up that difference, while also fending off Sacramento, which is 1 1/2 games ahead of the Lakers. Part of the Lakers’ defensive struggles can be traced to the absence of Lonzo Ball, who has missed nine games with an ankle sprain. Kuzma incinerated the Sixers defense, dropping 39 points — the second-most of his career — on 14-of-21 shooting. He hit five 3-pointers on the night, getting it done with his jump shooting while mixing in a few Eurostep finishes at the rim. The sophomore was electrifying in the first quarter, scoring 23 of L.A.’s 40 points. Meanwhile, LeBron James nearly pieced together back-to-back triple-doubles, as he did a bit of everything with 18 points, 10 rebounds and nine assists. But the issue against Philadelphia (36-20) was defense, as Joel Embiid was a monster down low, putting up 37 points on 12-of-16 shooting with 14 rebounds. Philly’s new-look starting lineup feasted all afternoon. Tobias Harris (acquired at the trade deadline) had 22 points with six assists, while J.J. Redick contributed 21 points. Meanwhile, Lakers President of Basketball Operations Magic Johnson flew to the game and addressed the team before tip-off, regarding the past week of trade rumors. 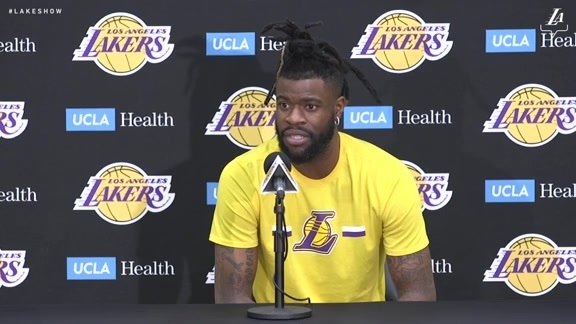 Reggie Bullock started in his first game as a Laker, shooting just 1-of-5 but adding three assists and several strong defensive plays. … Mike Muscala also made his Lakers debut (against his former team) and had eight points. … Brandon Ingram scored 19 points.